"Sampath Speaking" - the thoughts of an Insurer from Thiruvallikkeni: sad tale of dropping of Mithali Raj ~ would Board & coach explain ? sad tale of dropping of Mithali Raj ~ would Board & coach explain ? In Cricket, especially in shorter versions, it is the form and sooner a star player could be shown the exit – gone are those days, when players got selected on reputation. The effervescent king MS Dhoni stands omitted from T20s .. .. and there was more Shocking thing to happen – a player who has socred 663 runs in 10 tests; 6550 runs in 197 ODIs and 2283 in 85 T20s was dropped for an all important match – which India lost - it was a ,World T20 semi-final, against the very side that broke their hearts in the World Cup final last year. In Aug 2014 at Wormsley ‘Indian women won the One-off test by 6 Wickets’… England Women 92 & 202; India Women 114 & 183/4 (95.3 ov) is what the brief score reveals .. 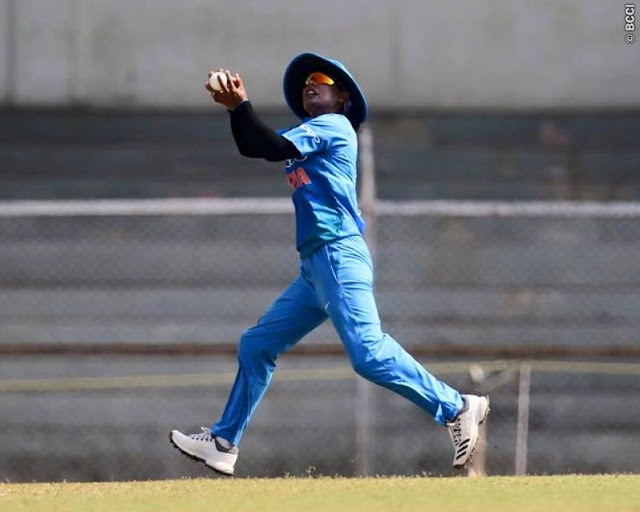 There were 10 debutants – 8 from Indian side (E Bisht, Murugesan Dickeshwashankar Thirush Kamini, H Kaur, Smriti Mandhana, Nagarajan Niranjana, S Pandey, PG Raut and Shubhlakshmi Rajendra Sharma) and that has a story to reveal….a sad one at that ….. prior to that - the last time England Women hosted their Indian counterparts in a Test match was when Tony Blair was Prime Minister in 2006 and only three players of that match remained - players - Mithali Raj, Jhulan Goswami and Karu Jain – not the fault of others, as 8 years had rolled by in-between. In Sept 2006 at Taunton, in Test no. 129, Mithali Raj was the Captain; the star was seam bowler Jhulan Goswami, who took five wickets in each innings and ended with superb figures of 10 for 78. Mithali Raj is a fabulous player – way back in Aug 2002, at Taunton, Mithali Raj made the highest score in the history of women's Test cricket – 214 ! - The 19-year-old from Jodhpur smashed several records on her way making 214 off 407 balls with 19 fours .. a classy player, now getting drowned. After enjoying an unbeaten run in the group stage of the Women's World T20 in Guyana, India's batsmen collapsed spectacularly against England in their semi-final in North Sound and exited the tournament. An attacking approach - amplified by captain Harmanpreet Kaur's blistering hundred in the tournament opener - had served India well in Guyana, but it worked against them at the Sir Vivian Richards Stadium, which offered more turn to the spinners. Harmanpreet, Veda Krishnamurthy and Anuja Patil all fell while looking to hit aerially, as India crashed from 89 for 2 to 112 all out. .. .. and there was no place for Mithali Raj !! – she had been dropped !!! Mithali Raj has accused India women head coach Ramesh Powar and former captain Diana Edulji - a member of the Committee of Administrators (CoA) supervising the BCCI's operations - of leaving her "deflated, depressed and let down" with their actions during the recently concluded World T20 in the Caribbean. Raj, who was controversially left out of the starting XI in India's eight-wicket semi-final loss to England, has also termed India T20I captain Harmanpreet Kaur's decision to support her exclusion "baffling and hurtful". Ever since Mithali Raj was dropped for the World T20 sem-final against England, there have been murmurs that India's T20I captain Harmanpreet Kaur does not get along with her senior team-mate. After the game, Harmanpreet had said, "We were going with a winning combination. We did really well against Australia. And that is the reason we just wanted to go with the same combination." In her email, Raj called Harmanpreet's decision "hurtful", but said she was still optimistic of sorting out any differences via a face-to-face meeting. "I have nothing against the T20 captain Harmanpreet Kaur except for the fact that her call to support the decision of the coach to leave me out of the eleven was baffling and hurtful," Raj said in the email. "I wanted to win the world cup for my country and it hurts me because we lost a golden opportunity. But I am of the opinion that Harman and I are senior players and our issues, if any, should be sorted out by the two of us by sitting across the table. Raj laid bare her feelings in an email on Tuesday to the BCCI CEO Rahul Johri and the BCCI general manager, cricket operations and women's cricket, Saba Karim. Raj sent the email a day after meeting Johri and Karim in Mumbai to discuss the fallout of the controversy concerning her exclusion from the World T20 semi-final. Among others who met Johri and Karim on Monday were Harmanpreet and team manager Trupti Bhattacharya. In the email, accessed by ESPNcricinfo, the majority of Raj's ire is directed at Powar, the former Mumbai and India offspinner who took over as the India women head coach in July, after Tushar Arothe's resignation. Raj, who has opened the batting across formats for the past several years, was pushed down the order in India's tournament opener against New Zealand. According to Raj, Powar told her the move was made in order to increase India's batting depth. Raj says she approached Sudha Shah, the national selector on tour, after Powar told her she wouldn't open. On the morning of the next game, against Pakistan, Powar told her she would open. Raj opened against Pakistan and Ireland, and scored half-centuries in both games. Raj reaching out to the selectors, according to her email, changed Powar's behaviour towards her. Raj injured her knee during the match against Ireland and missed India's final group game, against Australia. Raj says Powar told her "not to come to the ground" for that match, and - after she asked the manager to intervene - "not to step out of the dressing room" for its duration. Then, Raj says Powar called her onto the ground to join her team-mates in a victory lap. Raj's knee recovered in time for the semi-final, but she says it was evident days before the match that Powar had made up his mind to leave her out. Raj says she was paired up with the lower-middle-order batsmen in the nets, and made to face part-time bowlers. "The kind of practice given to a player who is not in your scheme of things in a key match." Raj also said she felt let down by Edulji, her former Railways and India captain, who had said it was not the CoA's "headache" to interfere in the controversy surrounding the semi-final, or any other decision of the team management. The fact that the media gained access to Raj's mail, meanwhile, has perturbed Amitabh Choudhary, the BCCI's acting secretary. He emailed Johri and Karim, with the subject line "LEAKAGE OF REPORT". For statistics, Mithali’s 214 was pushed to 2nd place in 2004 by Kiran Maqsood Baluch a Pak player, who made her debut in 1997. She went on to play 40 One Day Internationals (ODIs) and 3 Test matches for Pakistan. Her 242 against the West Indies in 2004 is the highest individual score in Women's Test cricket.